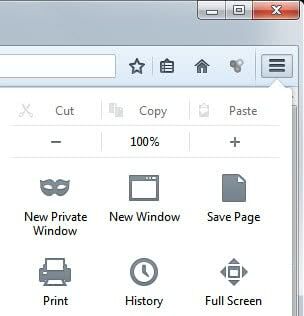 The latest nightly build of Firefox 3.1 included a first version of the long awaited private browsing feature. Private Browsing refers to a special mode in Firefox that users can activate to run a sandboxed version of the browser that does not write session data to the local system. Unlike Google Chrome's Incognito Mode Firefox will close all tabs that have been opened before starting the Private Browsing mode and restore them once the Private Browsing session is closed again. Google Chrome on the other hand can spawn a private browsing window independently from standard browsing windows so that users can use both types at the same time. Update: Mozilla modified the private browsing mode in Firefox in recent time. It is now possible to run private browsing windows next to regular windows. It is important to note that private browsing is only blocking local data from being written. It won't change anything on the remote side of things which means that Internet Service Providers and websites get the same information as before about the user's visit. 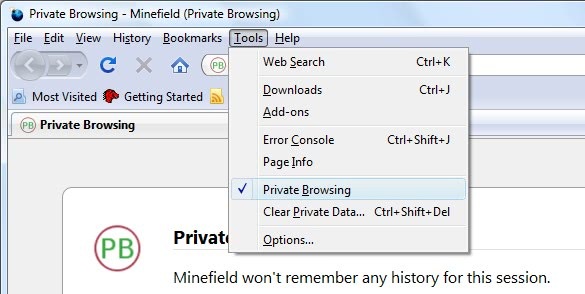 Private Browsing can be enabled in the Firefox Tool menu. It will display a popup containing information that private browsing mode will be started and all currently open tabs will be saved to be reopened after the private browsing session ends. Update: This too changed in recent versions. You can start a private browsing session with a click on the Firefox menu and the selection of new private window. Alternatively, use the shortcut Ctrl-Shift-P to spawn a new private window. Firefox will not record the browsing history, search history, download history, web form history, cookies and temporary Internet files. Bookmarks as well as downloads on the other hand will be retained in private browsing mode. Firefox will add the (private browsing) string to the title which is a indicator for anyone that Private Browsing is enabled. Private Browsing can be disabled from the Tools menu again by selecting the same menu entry that activated it or by closing the window. Users who regularly clear data when they close or open Firefox may wonder why they should be using the Private Browsing mode at all. The main difference between clearing data when closing the browser and using the Private Browsing mode is that the Private Browsing mode will never store data on the hard drive. This might however happen when cleaning Firefox data by closing the browser. First, data may be recovered and second it may still be there if Firefox closes unexpectedly. A first look at Firefox's new private browsing mode which allows you to browse the Internet without leaving local traces about it. Private Browsing for me is a way to keep spyware and viruses (and botnets) from sneaking onto my computer. If a virus sneaks into my registry or system files without the sandbox, clearing Firefox’s history will not remove it. Sandboxing is not a guarantee that you will not need security software, but it is my first line of defense. This is now broken in FF 11.0 – the previous tabs are not re-opened if you restart from a Private Browsing session.